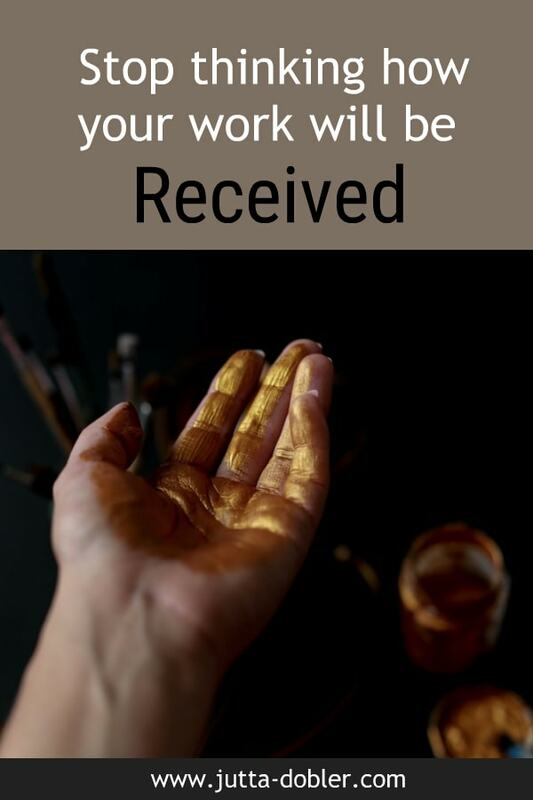 You can’t bring good work through and at the same time have some of your attention on how it will be received. Questions like: ‘Will it sell?’ have no place in the creation process. There is a place for marketing and networking and getting yourself 'out there'. It has to happen if you want to earn money with your work. But not while you are doing the actual creating. If you try to birth your vision while at the same time being concerned if others will like it, you are cutting yourself off from all that wants to come through that is bigger than you. You stay stuck in your head, in your fear of survival, in your ‘little you’. And all that comes out comes from this place. It will then be so personal, so important, so connected to who we are, that if IT gets rejected, you think YOU are getting rejected. If that happens often, you lose self confidence and begin to feel like a failure. While this is understandable, it is also a slippery slope to becoming unproductive and miserable. If you ever want to ‘make it’ as an entrepreneur or an artist, you have have HAVE to become independent of what others think of you! This is the number one requirement to bringing through authentic, powerful work. It is much better to have a menial job on the side that pays you something, than to adjust what you are making to become financially successful. Because if you do, you first of all might lose yourself and your sense of who you are. And secondly, people will probably still not buy. For someone to want to buy from you, you have to touch a nerve within them. You have to make them feel! While this can be done in a manipulative way (see a lot of the advertisement we get bombarded with), this is generally not an option for a heart-centered person. For you, the only way to make people feel is to be totally authentic. Being real transcends the outer layers of our experience. Our skin color, our age or gender or level of education. Our attractiveness. Our current life circumstances. If someone creates something truly authentic, you will be touched by it even if you don't speak her language or share her culture. It will leave you changed in some way. THIS is what true honesty, true art, true alchemy, are all about. And if you are a creative, this is what you are striving for, and this is the only thing that will satisfy you. Because then you know that you are fulfilling your purpose. And Nothing less will do!